2 2 responsible or liable, directly or indirectly, in any way for any loss or damage of any kind incurred as a result of, or in connection with, your use of, or reliance on, any Content. Intellectual Property Rights The Website and all of the Content (including the organization and layout of the Website and all software used in connection with the Website) are, and at all times remain, the property of CENTURY 21, its franchisees, brokers, sales people and/or licensors. The Website and all of the Content are protected by intellectual property rights owned by CENTURY 21, its franchisees, brokers, sales people and/or licensors. You agree to abide by all intellectual property notices, information and restrictions on, or displayed with, the Content. Note that any Content owned by CENTURY 21 s franchisees, brokers, sales people or licensors may be subject to additional restrictions. 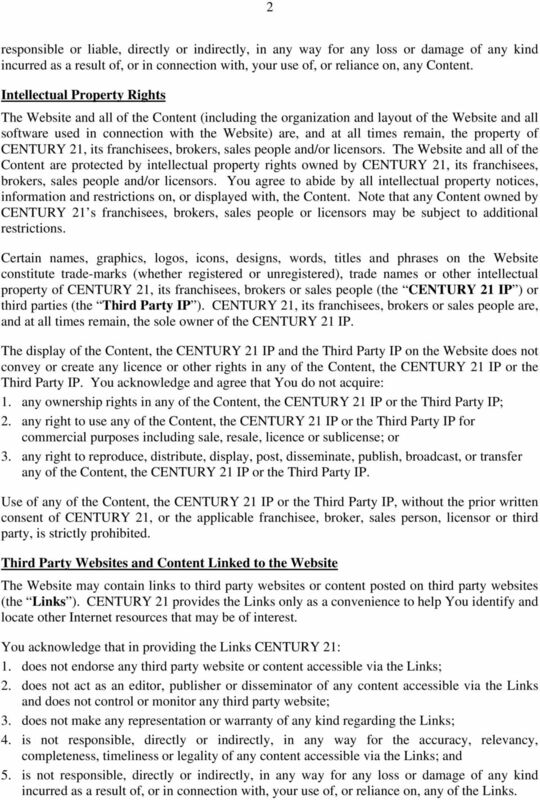 Certain names, graphics, logos, icons, designs, words, titles and phrases on the Website constitute trade-marks (whether registered or unregistered), trade names or other intellectual property of CENTURY 21, its franchisees, brokers or sales people (the CENTURY 21 IP ) or third parties (the Third Party IP ). CENTURY 21, its franchisees, brokers or sales people are, and at all times remain, the sole owner of the CENTURY 21 IP. The display of the Content, the CENTURY 21 IP and the Third Party IP on the Website does not convey or create any licence or other rights in any of the Content, the CENTURY 21 IP or the Third Party IP. You acknowledge and agree that You do not acquire: 1. any ownership rights in any of the Content, the CENTURY 21 IP or the Third Party IP; 2. any right to use any of the Content, the CENTURY 21 IP or the Third Party IP for commercial purposes including sale, resale, licence or sublicense; or 3. any right to reproduce, distribute, display, post, disseminate, publish, broadcast, or transfer any of the Content, the CENTURY 21 IP or the Third Party IP. Use of any of the Content, the CENTURY 21 IP or the Third Party IP, without the prior written consent of CENTURY 21, or the applicable franchisee, broker, sales person, licensor or third party, is strictly prohibited. Third Party Websites and Content Linked to the Website The Website may contain links to third party websites or content posted on third party websites (the Links ). CENTURY 21 provides the Links only as a convenience to help You identify and locate other Internet resources that may be of interest. You acknowledge that in providing the Links CENTURY 21: 1. does not endorse any third party website or content accessible via the Links; 2. does not act as an editor, publisher or disseminator of any content accessible via the Links and does not control or monitor any third party website; 3. does not make any representation or warranty of any kind regarding the Links; 4. is not responsible, directly or indirectly, in any way for the accuracy, relevancy, completeness, timeliness or legality of any content accessible via the Links; and 5. is not responsible, directly or indirectly, in any way for any loss or damage of any kind incurred as a result of, or in connection with, your use of, or reliance on, any of the Links. 3 3 You agree that You are solely responsible for: 1. taking all protective measures to guard against viruses and other destructive elements; 2. abiding by the terms and conditions of use and the privacy policies posted at the third party websites; and 3. evaluating the content accessible via the Links and bearing all risks associated with your use of, and reliance on, any such content. 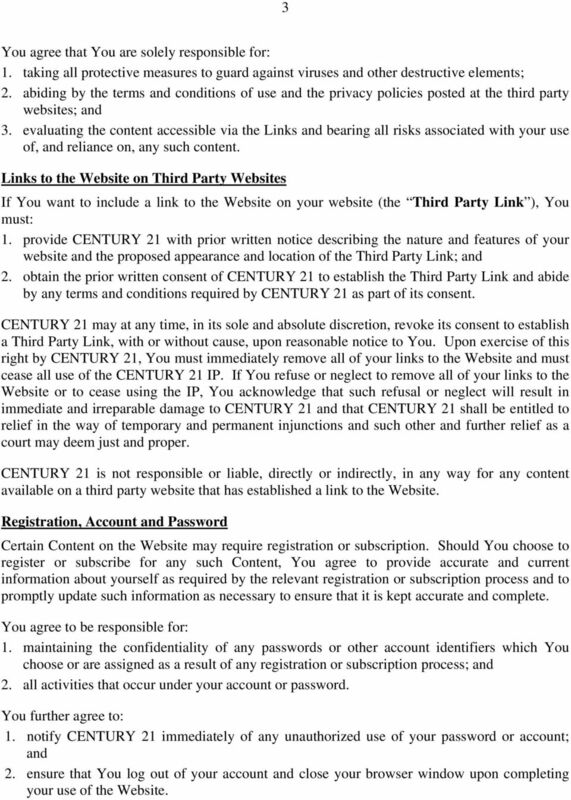 Links to the Website on Third Party Websites If You want to include a link to the Website on your website (the Third Party Link ), You must: 1. provide CENTURY 21 with prior written notice describing the nature and features of your website and the proposed appearance and location of the Third Party Link; and 2. obtain the prior written consent of CENTURY 21 to establish the Third Party Link and abide by any terms and conditions required by CENTURY 21 as part of its consent. CENTURY 21 may at any time, in its sole and absolute discretion, revoke its consent to establish a Third Party Link, with or without cause, upon reasonable notice to You. 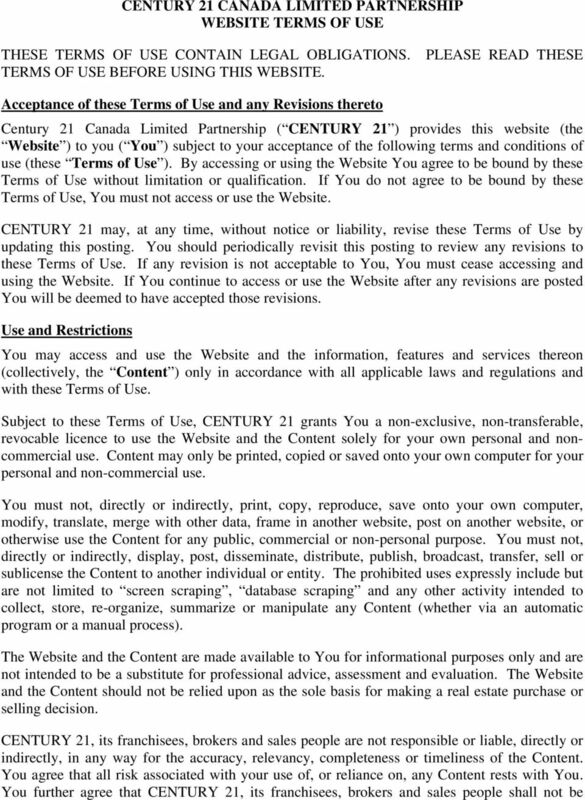 Upon exercise of this right by CENTURY 21, You must immediately remove all of your links to the Website and must cease all use of the CENTURY 21 IP. 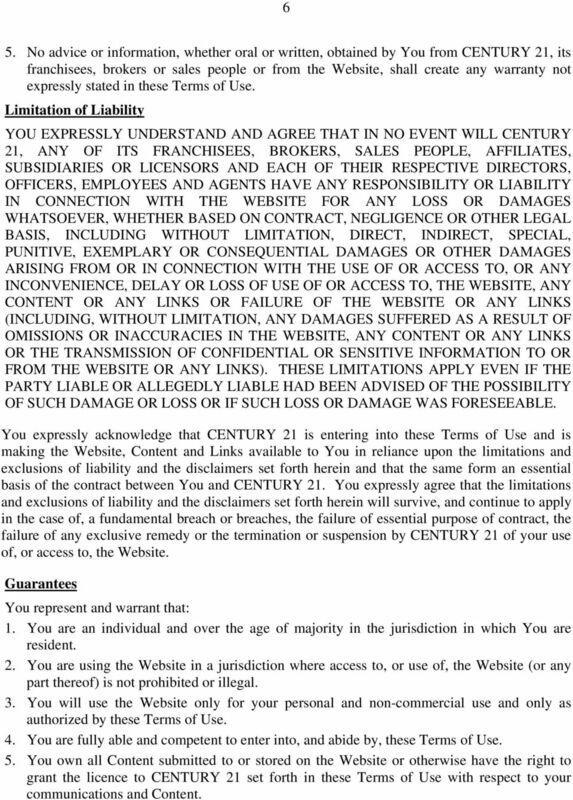 If You refuse or neglect to remove all of your links to the Website or to cease using the IP, You acknowledge that such refusal or neglect will result in immediate and irreparable damage to CENTURY 21 and that CENTURY 21 shall be entitled to relief in the way of temporary and permanent injunctions and such other and further relief as a court may deem just and proper. CENTURY 21 is not responsible or liable, directly or indirectly, in any way for any content available on a third party website that has established a link to the Website. Registration, Account and Password Certain Content on the Website may require registration or subscription. Should You choose to register or subscribe for any such Content, You agree to provide accurate and current information about yourself as required by the relevant registration or subscription process and to promptly update such information as necessary to ensure that it is kept accurate and complete. You agree to be responsible for: 1. maintaining the confidentiality of any passwords or other account identifiers which You choose or are assigned as a result of any registration or subscription process; and 2. all activities that occur under your account or password. You further agree to: 1. notify CENTURY 21 immediately of any unauthorized use of your password or account; and 2. ensure that You log out of your account and close your browser window upon completing your use of the Website.